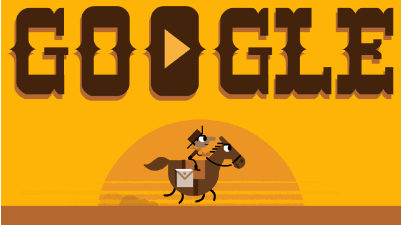 April | 2015 | 50 Westerns From The 50s. 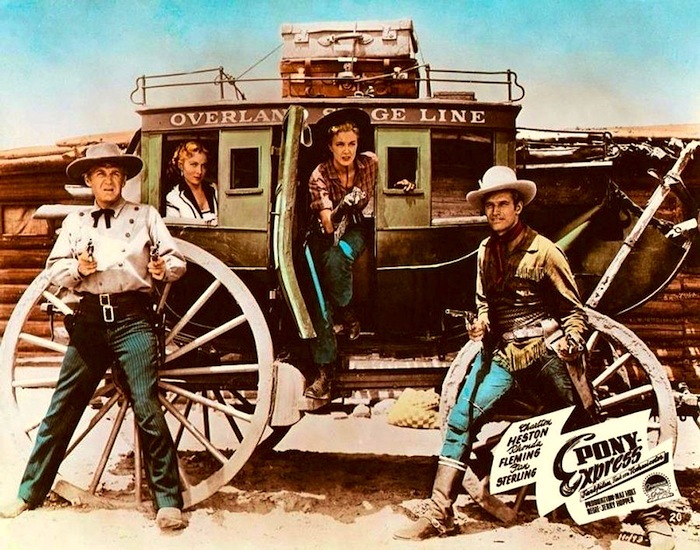 50s Westerns Blu-ray News #178: The Wonderful Country (1959). It’s great to see Robert Mitchum’s independent, self-produced pictures — some of his best work, in my opinion — making their way to Blu-ray. First, Thunder Road (1958) just came out from Shout Factory. 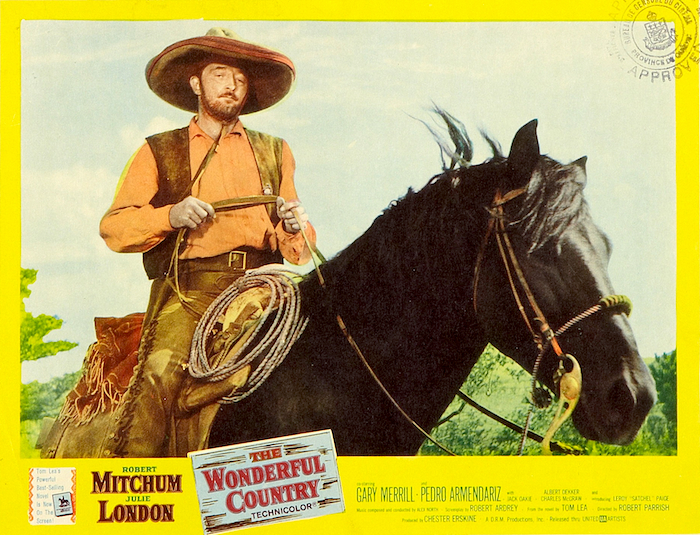 And now, Kino Lorber has announced The Wonderful Country (1959) for Blu-ray release in September. Based on Tom Lea’s novel, this is an unusual Western, to say the least (just look at that cast), and a really terrific movie. John Knight mentioned the great Republic director Joe Kane in a comment this morning, and this photo came to mind. 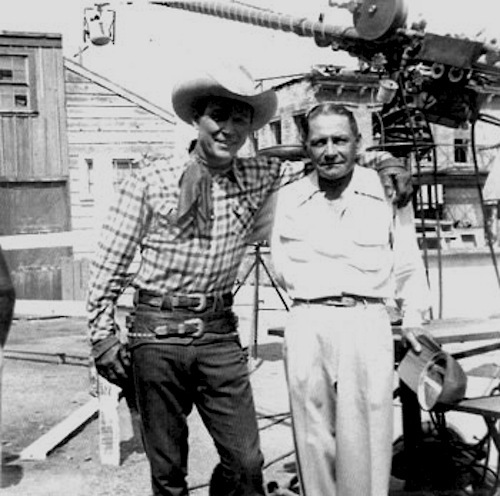 Here, Joe’s visiting Roy Rogers on the set of his TV show. 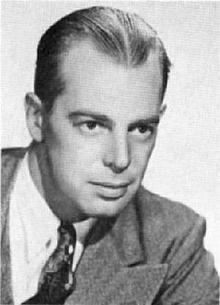 From the mid-30s till the studio’s demise, Kane was a house director at Republic Pictures. 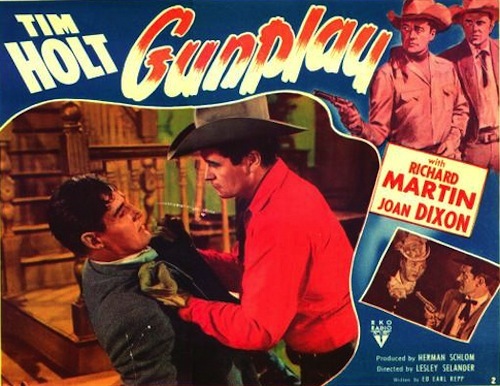 He made a slew of Gene Autry and Roy Rogers movies, and produced and directed Republic’s larger-scale films such as Jubilee Trail (1954) and The Maverick Queen (1956). Sadly, his later films are almost impossible to see today, especially if you’re a stickler for things like 1.85 or Naturama. James Best, whose early career was filled with 50s Westerns, has passed away. His career in features and television was a long one. 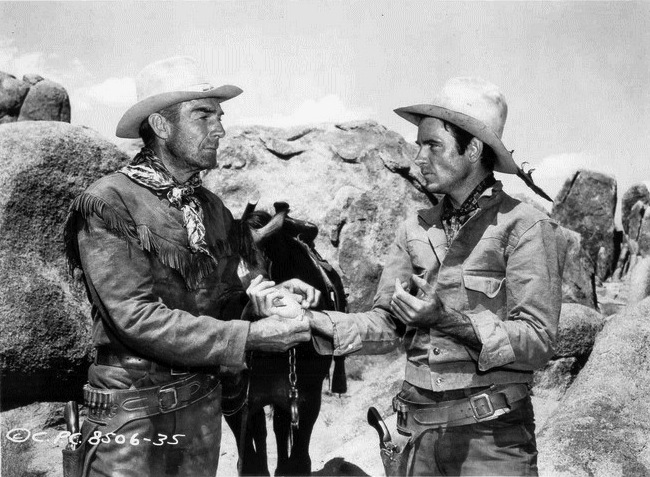 He’s seen here with Randolph Scott in Budd Boetticher’s Ride Lonesome (1959) — just one of the many 50s Westerns Best appeared in. His autobiography Best in Hollywood: The Good, The Bad and the Beautiful has lots of great stories about making those films and is worth seeking out. This is one of my favorite photos to ever appear on this blog. 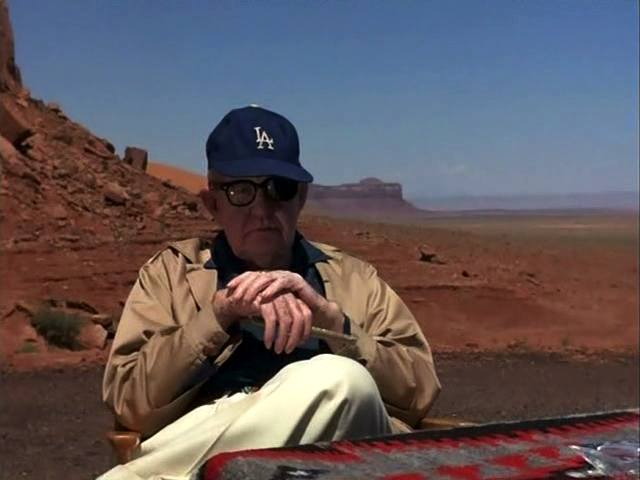 And I look forward to the beginning of baseball season — not just because baseball’s back, but because I get another chance to post this image of John Ford, his Dodgers cap and Monument Valley. 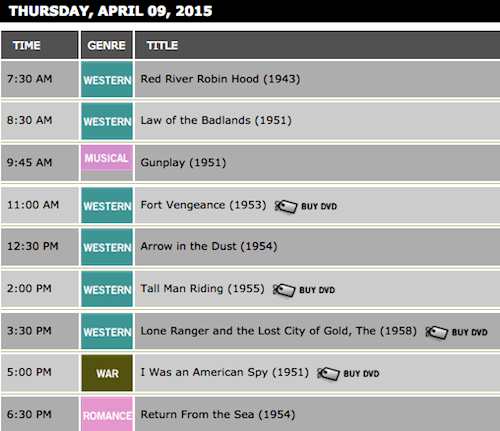 TCM Alert: Spend Next Thursday With Lesley Selander. 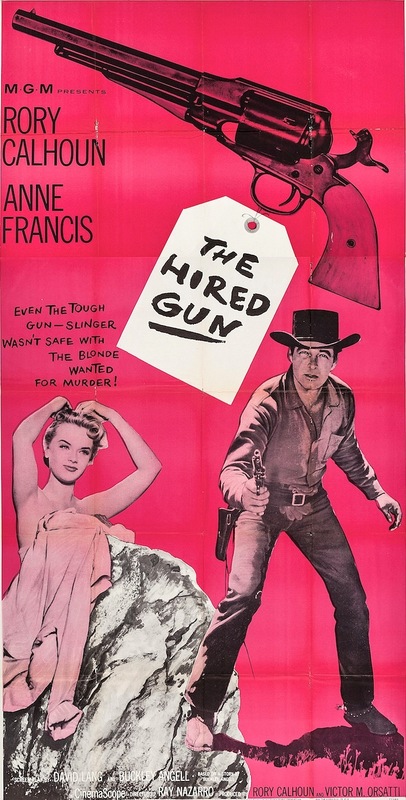 Next Thursday, April 9, Turner Classic Movies (TCM) will highlight director Lesley Selander by running nine of his films, three of them part of RKO’s excellent series of B Westerns starring Tim Holt (Gunplay is a very good one). 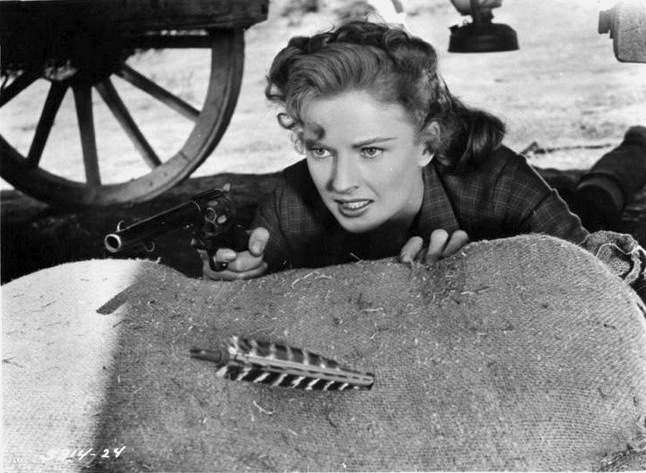 Arrow In The Dust (1954) stars Sterling Hayden and Coleen Gray. Tall Man Riding (1955) is a solid Randolph Scott picture. And The Lone Ranger And The Lost City Of Gold (1958) is the second TV spinoff feature to star Clayton Moore and Jay Silverheels. I’m a big fan of Lesley Selander. When it comes to action, he’s one of the best. It’s good to see him get this kind of attention. His films are short, smart, fast — and highly recommended. The times listed are Eastern Standard Time. This is a “restoration” of a shorter post. Thanks to Blake for pointing out all I’d missed.